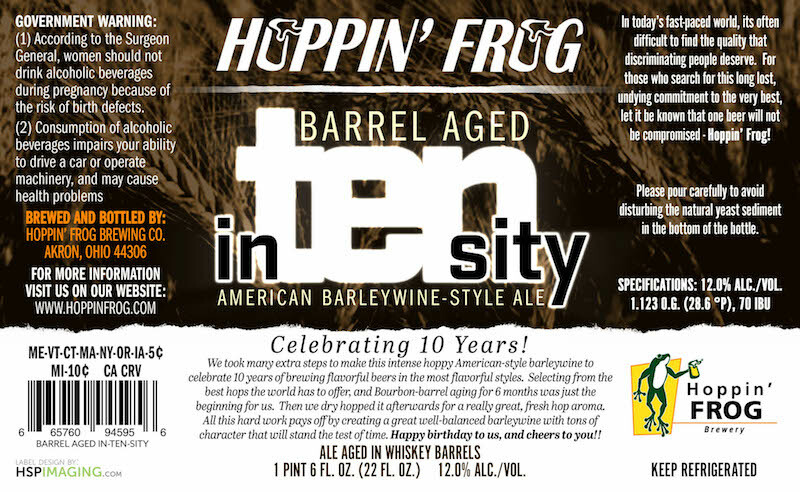 (Akron,OH) – We start our week-long 10-Year Anniversary celebration at Hoppin’ Frog Brewery today! To start the week off right, when we open today at 5 pm we will release Barrel Aged In-Ten-Sity, our very special 10-Year Anniversary beer!! It is a hoppy, American barleywine at 12% abv, that has been let age to mature 6 months in Bourbon barrels, so it could be served on the very first day of its release! We went the extra mile to create something really special, by dry hopping it AFTER aging in the barrels! All this hard work pays off with a rare, inviting, freshly dry-hopped American hop aroma in a mature, ready-to-drink barleywine. That makes our 10-Year Anniversary beer somewhat unique, and gives it some real pizzazz!! Barrel Aged In-Ten-Sity will be on tap all week starting today at 5 pm, and for sale to-go in our 22-ounce bottles. Our 22-ounce bottle price is $18.99, with 10% discounts on mixed cases of 12 bottles. There is a limited quantity available so there is a 1-case limit per person. This beer will only see a small amount of distribution in Ohio, so get yours while it lasts! Beer News, Half Acre Beer Co.
Can Release Daily 4/19/19 – Bearded Iris, Kane Brewing, Tired Hands & More!